Apple Watch is one of the most desired smartwatches on the market. Apple’s smartwatch lineup has come a long way since the day one and now dominates the market. According to the latest sources, the Apple Watch 3 with LTE connectivity now leads the smartwatch market with millions of units shipped every quarter. Sources say that Apple will continue to dominate the smartwatch market later this year when the company announces the Apple Watch series 4. In reality, the fourth generation Apple Watch is expected to follow in the footsteps of its predecessors. And, the device is shaping to be a hit on the market this year. 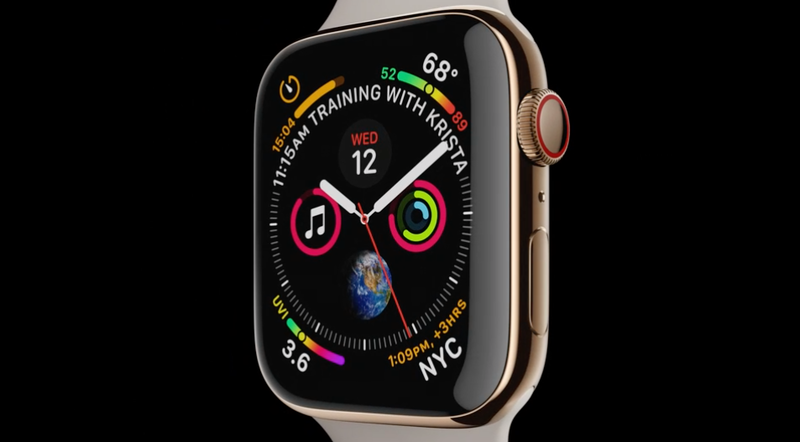 At this year’s September event, Apple debuted the Apple Watch Series 4 after months of leaks and rumors. Even though the September event belongs to new iPhones, the new Apple Watch really shines out there thanks to its stunning design and exciting features. Basically, the Apple Watch 4 brings in a number of notable upgrades we have been expecting to see for a long time. In reality, the latest version of Apple Watch retains everything from the last year’s model. Specifically, you will get an integrated GPS, LTE connectivity, and an 18-hour battery life. In the section below, we are giving you a quick look at Apple’s newest smartwatch model, Apple Watch 4. For some background, pre-orders for the new Watch will go live on September 14 and the device will ship worldwide on September 21. When it comes to pricing, the non-LTE Apple Watch 4 will cost $399 at launch, while the LTE variant will retail for $499 in the US. Apple’s lineup of smartwatches has not seen a huge design change since the launch day. And, there is no exception to this year’s models. The Apple Watch 4 takes a lot of design hints from the previous models. That means that we will have a rounded design. However, Apple increases the screen size on the Apple Watch 4 to make it 30 percent bigger than its predecessors. The Apple Watch 4 features the same rectangular OLED display that’s highlighted by rounded edges. However, the new Watch is thinner than the previous models, allowing for a more comfortable hands-on experience. The larger display offers a more enjoyable experience for any user ranging from getting your sports scores to listening to music. The Digital Crown still sits on the side of the device. However, Apple has revamped it so it now includes support for haptic feedback. The microphone is located on the opposite side, while the heart rate monitor can be found at the back of the watch. The rear of the watch is ceramic and sapphire, so it offers a premium look. According to Apple, the 4th generation Apple Watch will be available in a wide range of colors, like Space Grey, Gold, and Silver. Apple also says that the company will add more colors to its watch lineup in the coming months. The Cupertino firm adds that the Apple Watch 4 will be compatible with all the current straps and bands on the market. Sources say that Apple will team up with Nike to announce a variant of Apple Watch 4 with Nike custom straps. In reality, Apple and Nike have been in a long-term partnership as Apple CEO, Tim Cook is now Nike’s independent director. WatchOS is one of the best wearable operating systems on the market. Apple has been adding new features to its smartwatch operating system on a semi-regular basis. WatchOS is at a point where we can ignore Wear OS and Samsung Tizen OS. At this year’s WWDC event, Apple welcomed WatchOS 5 to the world. Basically, the new version of WatchOS does not bring in a significant upgrade, but it has its own selling-points that attract more users, ranging from auto-workout detection to Walkie-Talkie. The Apple Watch will come with WatchOS 5 pre-installed this year. The adoption of WatchOS 5 allows for better fitness features, which helps you boost your workout sessions. Besides, with LTE connectivity, you can listen to your music on the go without the need for a nearby iPhone. One of the biggest additions to WatchOS 5 lies in Walkie-Talkie, a handy feature that allows Apple Watch users to talk to each other more quickly. All you need to do is a simple push of the button, and you will be able to chat with your friend via Wi-Fi or cellular. On the surface, the Apple Watch 4 might not be a huge upgrade, but there are a lot of hardware changes under the hood. Specifically, the new Watch is fueled by a new S4 dual-core processor, which allows for up to two times faster performance when compared to the last year’s models. However, the adoption of the new chip will not affect battery life. Apple claims that the new Apple Watch will last 18 hours, which shares the same capacity as the previous models. Besides, you will get 6 hours of battery life on the GPS, which is pretty impressive for a wearable with multiple connectivity options. The Apple Watch 4 also features new sensors, allowing for better movement detection. The coolest part is that the watch now includes the ability to call for help. For instance, the watch will detect that you fall or slip and suggest if you want to call for an emergency service. Like its previous models, the Apple Watch 4 comes with a heart rate monitor that allows you to keep track of your pulse. Besides, it will notify if it detects any usual heart activity or issues so that it gives potential solutions. According to Apple, the new Watch features an electrical heart rate sensor that allows you to take an electrocardiogram. The Apple Watch 4 is a great wearable device that adds a slew of improvements to internal components. With Apple Watch 4, Apple is turning its smartwatches into a useful device, rather than a luxury item on your wrist. What do you think of this year’s Apple Watch 4? Let us know in the comments below.